OPENING SESSION: "A NEW VISION FOR SUSTAINABLE PEACE"
Distinguished Guests, Ambassadors for Peace, Ladies & Gentlemen! It is my sincere pleasure as Chair of the principle host organization of this European Leadership Conference to welcome you all most warmly to this special 2 day conference on the theme "Sustainable Peace for a Sustainable Future" organized as part of the United Nations’ ‘International Day of Peace’ and with the generous collaboration of the Norwegian Ministry of Foreign Affairs. I want to begin by expressing deep appreciation to the Norwegian Ministry of Foreign Affairs for all their help and support in putting on this conference. No nation in Europe (and perhaps none in the rest of the world either!) has become as synonymous with efforts for world peace as has Norway through its leading role in peace promotion and peace advocacy and its consistent contribution to U.N. peace keeping efforts around the world over many decades. UPF is deeply grateful to the Foreign Ministry for providing generous sponsorship and excellent speakers and other logistical support for this event in collaboration with UPF’s ongoing commitment to support the work of the U.N. all over the world. Our event here today will be one of approximately 75 other such national level events on all 6 continents marking this day laid on by UPF chapters. As we all know, the United Nations was established in the aftermath of world war two with the principle aim of ensuring that such an horrific conflict would never, ever be allowed to arise again and of ensuring that humanity could in future enjoy lasting world peace. Since no truly global conflict has broken out since then, we can say that the United Nations has had a fair measure of success in fulfilling its mandate. Also, we know that in the interim it has, to a considerable extent, been effective in its peacekeeping role in many local situations of armed conflict around the world, thus preventing far worse conflict, suffering and loss of life. It has also done much to promote peace through human development, provision of food aid, improvement in agriculture, advancement of peace education, intercultural exchange and much else. There is indeed a great deal to be grateful for in the work of the U.N. and the occasion of the International Day of Peace is surely as appropriate an occasion as any to acknowledge all of its great work. At the same time, as the situation in Syria so clearly shows, it has to be recognized that there are severe limitations to the U.N.’s effectiveness and to its capacity to bring peace. There are clearly vital new frontiers in the search for lasting world peace that need to be explored if that ideal is to become a reality. I believe that it is both timely and appropriate that we should be considering today a “new vision for world peace”. Self evidently such a new vision is desperately needed and I look forward very much to hearing all the ideas expressed in that regard. 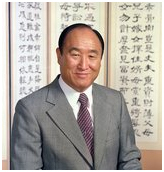 UPF’s Founder, Reverend Dr Sun Myung Moon, who so sadly passed away earlier this month, was a tireless worker for world peace who pioneered pathways to peace in many areas and who has left a remarkable legacy in that respect. He was warmly supportive of this event and I have no doubt that he will be with us in spirit here over these 2 coming days. Father Moon had both a very clear vision for how he felt the UN could increase its effectiveness as a global peace maker and, perhaps even more importantly, as to how individuals and non-governmental bodies could most effectively contribute to world peace. It is surely doubly appropriate that I should share with you something of that vision and legacy here today – both because it is so appropriate to our theme in this session and because it offers a timely valedictory reminder of his great contribution to world peace. Father Moon believed passionately that true peace could not be said to exist merely from an absence of war or open conflict. Rather, he believed that peace consisted of a state of mind and heart resulting from unity of mind and body centered upon the highest values within the individual. He believed that it had to be cultivated first in the minds of individual men and women and would then emanate upwards through interpersonal relationships to higher and higher social levels, until eventually it could facilitate peace between nations. He a greed profoundly both with UNESCO’s dictum that “Since wars begin in the minds of men, it is in the minds of men that defenses of peace must begin” and with Francis of Assisi’s prayer “let there be peace on earth and let it begin with me” His life was a living example and embodiment of both of these sayings. Both through his own personal initiative and through the organizations (like UPF) that he founded, he sought tirelessly to bring peace to the hearts of individuals as well as to resolve deeply rooted historical enmities and current conflicts that affected humankind as a whole. Given that his approach to peace was clearly founded upon the principle of “finding peace within oneself first” it is hardly surprising that he put so much faith in religion as the key medium through which it could be attained. He felt that religion had the most wisdom to impart about developing that sense of inner peace, through such injunctions as “love your neighbour as yourself!”, the golden rule common to almost all religious traditions. He also felt that since the allegiance to religion of people the world over was far stronger than to any merely social, political or economic entity, it was incumbent upon religion and religious leaders in particular, to take the lead in fostering the path to peace. To that end, he called on them to help adherents transcend all barriers that might exist to creating a consciousness of “one family under God” that race, ethnicity, nationality, gender and (yes!) narrow minded religiosity itself, presented. His promotion of interfaith dialogue and cooperation anticipated present trends in that area by several decades and he was especially insistent, once Soviet-backed communism fell, on the need for deep dialogue between Christianity and Islam as a means of preventing the “clash of civilizations” that Samuel Huntingdon warned of but which Father Moon always insisted was by no means inevitable. Perhaps his greatest contribution in formulating a new vision for world peace was to enthusiastically promote the idea of an Interreligious Council at The U.N. with a decision making capacity on a par with that of the Security Council. Since its inception, the U.N has formally given little credence to the wisdom of the worlds’ religions in its deliberations. With the initial cooperation of the government of The Philippines and latterly of some 49 other governments, that situation is happily now changing and a culture receptive to the input of the wisdom of the world’s religions is now being established step by step. There is real hope that it will lead eventually to the setting up of such an interreligious council and that this will permit the wisdom of the world’s religions to be formally acknowledged at long last in UN debates and decision making. Let us imagine for a moment how an interreligious assembly at The U.N. might have responded and helped to break the deadlock at The U.N. caused by the veto exercised by Russia and China against humanitarian intervention to save the lives of those threatened with massacre at the hands of Assad’s forces in Syria. We need to ask ourselves the question “Had such a Council existed, could the UN have been so dominated by the narrow and selfish concerns of individual nation states and would the desperate cries for help of the victims of tyranny and oppression in Syria have gone unheeded in the way that they did”? Religions tend by their very nature to be more universal in their concerns than do the national governments that currently dominate the UN’s decision-making processes and their memberships straddle national boundaries and are thus not so limited by nationalistic concerns. We can be reasonably confident that a far greater sense of compassion and humanitarian concern would have prevailed based on the notion that we are indeed our brothers’ keeper and that we are, as Father Moon likes to put it - “one family under God”. Makarim Wibisono, former President of The U.N. Human Rights Commision and also of the UN’s Economic and Social Council and one of the leading figures at The U.N. in the last 20 years has remarked that the “culture of heart” articulated and championed by Father Moon is the bedrock that is needed to underpin the culture of peace which the U.N itself has been advocating. It seems clear that any new vision of peace will only be realized if humanity recognizes that the last frontier to be conquered is not outer space or the deep sea mysteries of the Mariana Trench but the uncharted and as yet unconquered depths and latent capacity of the human heart. The absolute essence of what Father Moon taught and practiced was that we need to learn how to love – how to love unconditionally the unloved, the unlovable and most especially the “enemy” that has hurt us and caused us grief and pain. It is only that kind of love that can unlock the hearts of a Bashir Assad or any of the other pitiless tyrants or brutal dictators who still dominate so much of our world. Father Moon believed deeply that there is no historical enmity, no deep- seated conflict, no animosity between peoples races or nations that cannot be resolved using key peace making principles and the “logic of love” as distinct from the failed “logic of power” that is still so prevalent in today’s political decision making. I believe that this is the most fundamental dimension of the new vision for world peace that is needed in this age and I would like to cite just 2 out of many possible examples of this from Father Moon’s own life by way of illustration of what I mean. The first such example concerns Father Moon’s impact on the North/South conflict on the Korean Peninsular and his relationship with the hereditary dynasty founded by the late Dictator Kim Il Sung. Father Moon himself was born and raised in North Korea and spent most of his early life there. He only fled from there when obliged to do so by the advance of communist led forces during the Korean War in 1950 and sought refuge in the South under UN control. Since that time he has been separated from the many family members, including his mother and father that he left behind. Most of them have since died, including many who were murdered by the communists under Kim Il Sung who was to become dictator of North Korea after the separation into 2 independent Korean states. Between 1952 and 1991 Reverend Moon suffered countless attempts on his life inspired by North Korea to try to silence his strong anti-communist stance but survived them all and was also subject to a remorseless barrage of black propaganda against him in the world’s media largely inspired and directed by North Korea. Despite the murder of his family, his own experience in a communist death camp and all the assassination attempts against him in 1991 he returned at the risk of his life into the lion’s den of North Korea after making many offerings in prayer and clearing away any last traces of ill feeling that he may have harboured towards Kim. Offered the chance to address the “Peoples’ Assembly, the rubber stamp “Parliament” of North Korea he seized the opportunity to denounce the prevailing ideology of “Ju Cheism” which observers at the time feared would mean almost certain death for him. But notwithstanding his fearless words to a shocked Assembly, he was instead welcomed by Kim Il Sung at his private residence and embraced Kim like a long lost brother and with total forgiveness in his heart. Many joint projects to benefit North Korea were discussed and later implemented by Rev Moon as a result, including a car plant in Nampo, a five star hotel and much else, including cultural and student exchanges, soccer tournaments. Since that time 3 generations of North Korea’s leadership have looked to Father Moon as a bridge of peace between the North and the outside world, especially South Korea. That sense of trust has never been in doubt until this day and on Father Moon’s death it was reaffirmed in the most dramatic fashion a few days later with Father Moon being posthumously awarded the highest North Korean national honour for his efforts at unification of the Korean Peninsular, Rev Hyung Jin Moon, his 7th son and successor to many of his responsibilities being welcomed as a special state guest to receive the official condolences of the North Korean regime and an invitation being issued to Rev Moon’s widow, Dr Hak Ja Han to visit North Korea also as a special state guest. The key point that needs to be understood here is that all official governmental attempts at mediation and negotiation over several decades and based upon the logic of power (including threats and inducements of every kind) have failed to win the trust and sincere engagement of the north Korean regime. Quite simply, the logic of power has failed. When just a couple of years ago Yeongbyon Island came under mortar attack and the south’s naval vessel the ‘Cheonan’ was sunk with the loss of 48 sailors the so called six party talks mechanism involving Russia, China, Japan, South Korea and The United States, as well as North Korea itself, completely broke down and all communication between North Korea and the other five parties to the so-called 6 party talks ceased. It was an extremely tense and nervous situation. The only lines of communication between the North and the outside world that remained open were those to Father Moon and his representatives. That this example of “citizen diplomacy” has been so successful and seems so clearly to hold the key to ultimate reunification is above all testimony to how a heart of unconditional love, true reconciliation and forgiveness can profoundly affect the course of international relations for the better and is testimony to the lasting legacy of Father Moon’s peacemaking efforts. It also highlights the role that such non-governmental organizations can play in creating peace given that they are far freer than governments often are to maintain attitudes that governments that are vulnerable to fickle public opinion often cannot. Second, I would like to cite the example of Nepal. A similar conclusion can be drawn from the role UPF-Nepal played in the peace process to that of the peace-building undertaken by Father Moon in North Korea. In 2005, Rev. 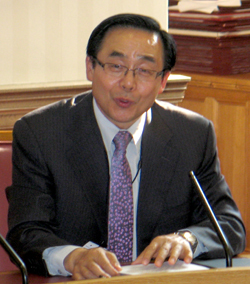 Moon personally visited the capital, Kathmandu, to launch the Universal Peace Federation. It was an extraordinary dimension of heart injected into the process by Father Moon and those working under him. It was carried on for years and purposely directed to facilitate dialogue and understanding that helped make a difference. Over many years a standoff existed between non-violent and democratic parties on the one hand and the Maoist insurgents on the other. Under the leadership of UPF-Nepal Chairman, who was a member of the Constituent Assembly, working with one of India’s senior and trusted diplomats who was also a former Indian Ambassador to Nepal, a series of peace initiatives were conducted. They were specifically designed to address roadblocks in the peace process and fostered the spirit of putting the interests of the nation above party politics. Nepal’s success in its peace initiatives has been publicly recognized by many. The trust, transparency, sacrifice, and non-partisan approach of UPF’s investment in the peace initiative ultimately led to the UPF-Nepal Chairman being appointment as a cabinet minister in the current government. Of course tensions remain, but once more citizen diplomacy guided by UPF’s Principle of Peace can be seen to have made a substantial difference and helped transform the political landscape for the better. Indeed the recent Clinton initiative in Oceania at the regional summit in the Solomon Islands can be seen as an indirect result of Father Moons’ initiative in his peace message delivered around the world in 2006 in which he called for the nations of that region to come together and present a common front by way of mutual protection against the threat of Chinese imperialistic ambitions in that region and also stands as part of his last legacy to the cause of lasting world peace.